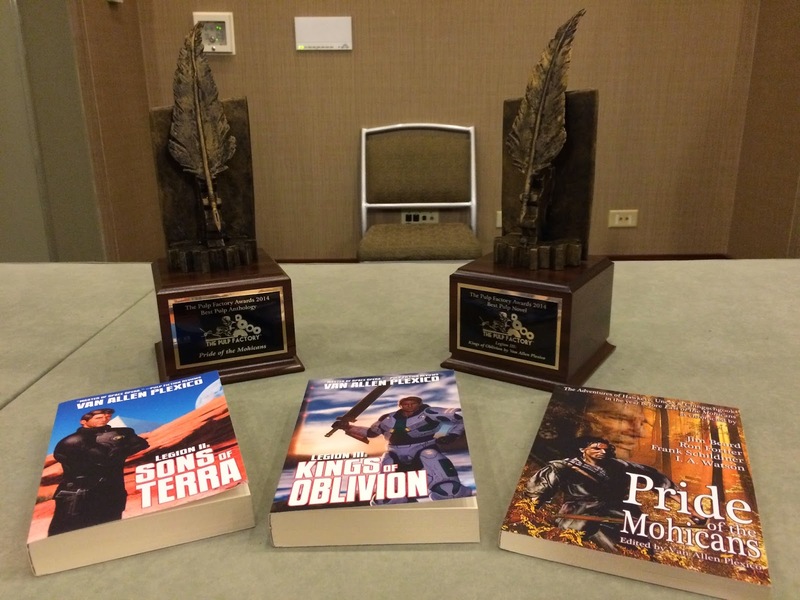 On Friday night, April 17th, at this year’s Windy City Pulp & Paper Convention, the sixth annual Pulp Factory Awards were presented. These awards spotlight the best in new pulp fiction and artwork from the previous year. The award trophies were presented by the Yahoo Pulp Factory Group Moderator, Ron Fortier and Rob Davis, Art Director for Airship 27 Productions. The Best Pulp Novel went to Van Allen Plexico for his space opera, “Legion III : Kings of Oblivion from White Rocket Books. The Best Pulp Short Story went to Ian Watson for his “The Fort of Skulls” which appeared in “Pride of the Mohicans” from White Rocket Books. The Best Pulp Cover went to Mark Williams for his painted cover to “Legion II : Sons of Terra” from White Rockets. Best Interior Illustrations went to Fabio Listrani for his illustrations in “Zombies Vs. Robots: No Man’s Land” from IDW. Our congratulations to all the winners and especially to White Rocket Books for their near sweep. The awards themselves reflected nominations from twenty-four new pulp publishers. The Domino Lady first appeared in the pulps in 1936. After graduating from the Berkeley College in California, Ellen Patrick goes off to Europe on a joy filled jaunt. Her trip is cut short when her widowed father, D.A. Owen Patrick is murdered by gangsters. Upon her return home she learns the corrupt authorities have no intention of finding her father’s killers. Thus she puts on a domino mask and a backless white dress to avenge him. Though arming herself with a small .22 automatic and a syringe full of knockout serum, the Domino Lady’s most effective weapon was her sensual beauty, which often distracted her opponents until she could turn the tables on them. 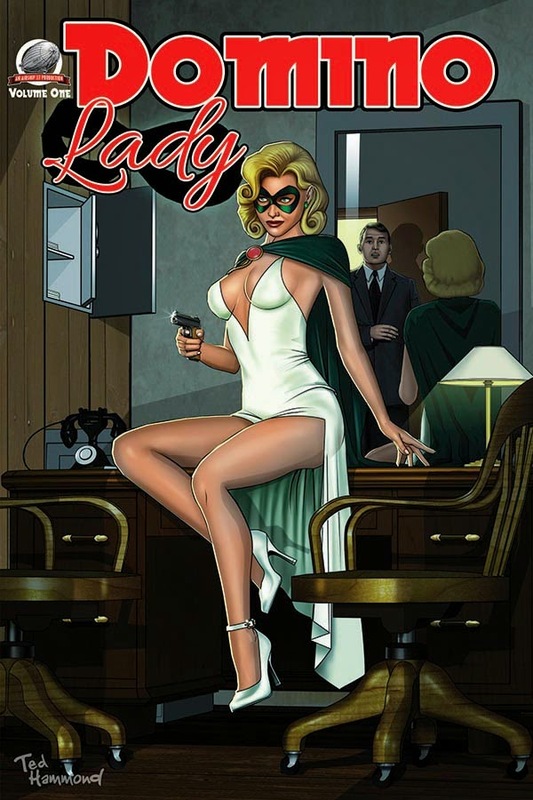 Now new pulp writers, Greg Hatcher, Gene Moyers, Tim Bruckner and Kevin Findley offer up four brand new adventures of Los Angeles’ most notorious, and sexiest, crime-fighter of them all, the Domino Lady! “Of course you can’t do a Domino Lady book without recruiting the best artists available,” Fortier continues. “And that’s exactly what we did.” Well known comic pro, James Lyle, provides twelve gorgeous black and interior illustrations and graphic artist Ted Hammond, known for his amazing pin-up work, produced the stunning cover that graces the cover. 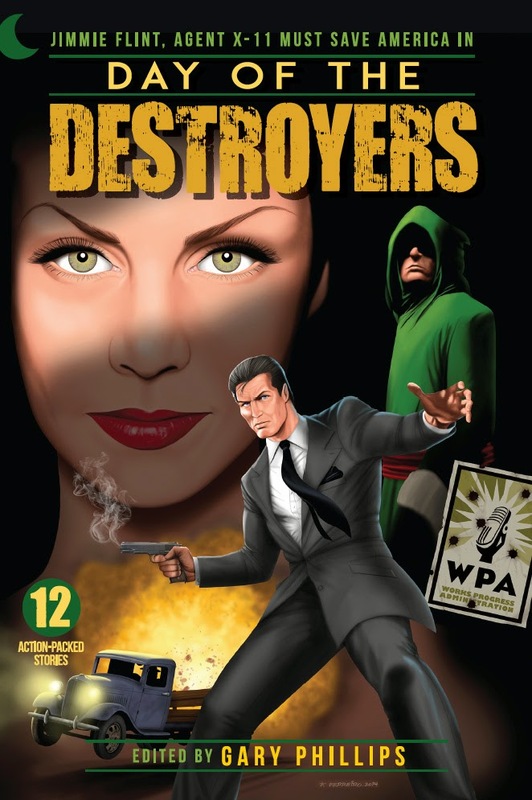 All of which was then perfectly assembled by Art Director Rob Davis to create a truly beautiful package no real pulp lover should do without.